William Piso was a Dutch physician and naturalist who explored the short-lived Dutch colonial holdings in Brazil in the 1630s and 1640s. This work, which describes and depicts samples of native animals and plants, was a significant contribution to the fields of ecology and tropical medicine. 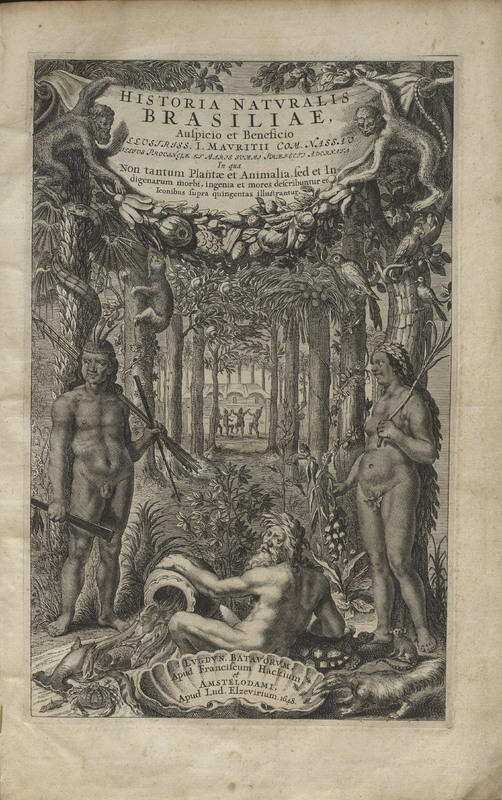 Detailed information in this book allowed distant scholars to understand the South American ecosystem without traveling there themselves. While Defoe locates Robinson Crusoe’s island off the coast of Venezuela, Crusoe is shipwrecked after departing his plantation in the Portuguese colony of Brazil on a journey to procure slave labor from Africa. Crusoe would eventually claim significant profits from his Brazilian plantation after returning to Lisbon, Portugal. Historia Natvralis Brasiliae ... In qua non tantum plantæ et animalia, sed et indigenarum morbi, ingenia et mores describuntur et iconibus supra quingentas illustrantur. Lvgdnvn. Batavorum: apud F. Hackium, apud L. Elzevirium, 1648.